The idea of going without shopping or spending for a month came to me in March after reading a book by a blogger who took on a more limited shopping moratorium that lasted for a year. It is only right that I should tell you about the book. Every time I had to write an update and justify why I was barely able to save any money, I told myself I could do better. I could save more, and I knew it. 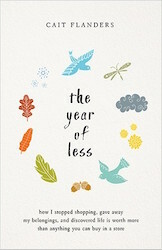 Annoyed and wanting to prove she can live on less money and be a “mindful consumer,” Cait decides that she will go without shopping for a year. A fan of lists, she starts by writing a list of “approved purchases,” exceptions to her “shopping ban.” The list covers things like boots, travel, business, food, and replacements for things that break. Then she goes from one birthday to the next buying nothing else. My own shopping moratorium is not the same as Cait’s, but it started in essentially the same way, with a suspicion that things were out of balance and the will to try something. Replacing my cell phone would remove a daily annoyance and make my life so much better. I deserved to have my life be so much better. It wasn’t until I physically added the new phone to the shopping cart on my cell phone provider’s website and looked at the total that I realized what was about to happen. If I hit the submit button, I was going to be buying something and, therefore, breaking the shopping ban. Having the ban loom over me not only stopped me from potentially wasting hundreds and thousands of dollars, it also forced me to pause and question what I was doing. I’ve found the same effect in my own spending moratorium. I started the month without the benefit of a list of exceptions, so every time I think about spending money or even so much as searching an online store, I have to appoint myself as judge and arbiter of my venture. Is the potential purchase important enough and urgent enough to justify an exception? This is enough of an interruption, it turns out, to bring the whole thought process to the surface. In a rapidly changing world, the notion that we can coast through life guided by unexamined habits is less valid than it ever was. More of us need to challenge more of our habits, including habits that we never stop to think about and habits like shopping that are socially approved and culturally ingrained. I hope readers of The Year of Less will see how easy this is to do.